AP Photo/Carolyn Kaster Senate Judiciary Committee member Sen. Amy Klobuchar, D-Minn.
KEVIN RAUCH/THE EXPRESS Three of the four ice climbers slowly make their way up the ‘Riverside’ along Renovo Road last week during the polar vortex that brought frigid temperatures to most of the United States. KEVIN RAUCH/THE EXPRESS If you look closely, you can see one of the brave climbers who made their way up the ‘Riverside’ along Renovo Road. KEVIN RAUCH/THE EXPRESS From left are ice climbers Westley Shaffer, Adam Albright, C.J. Baynum and James Henzeas as they climb the icy mountainside along the Renovo Road. RENOVO — As the recent cold snap of frigid weather concluded last Saturday, the majority of people living through the sub-zero mornings had just about enough of the polar-like conditions. No doubt many stayed in bed a little later than normal, covered under an extra blanket or two. But not these four guys. It was still dark outside and a brisk 3 degrees with a below zero wind-chill, when Westley Shaffer, Adam Albright, James Henze and C.J. 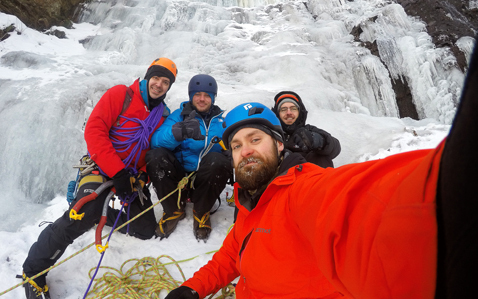 Baynham pulled off Route 120 in Baker’s Run, and got ready to climb some ice. Ask anyone in the Renovo area about the natural waterfall in Baker’s Run, about 14 miles east of town along the Renovo Road, and they’ll know exactly what you’re talking about. Some people have even unofficially named the spot to fit their unique thoughts of the natural marvel. Continuing with the talk around town … every year the dare devil climbers that scale the side hill capture the attention of those traveling along Route 120 during the coldest days of winter. “Did you see the nuts climbing the falls in Baker’s Run?” is likely a question that everyone in western Clinton County has heard. Even stopping along the road at the bottom of the ice cliff seems extraordinary to many. As the four climbers pulled in last week and were gearing up, passers-by assumed that they had car problems and slowed down to offer help. But, it was no accident that these four thrill seekers were there. 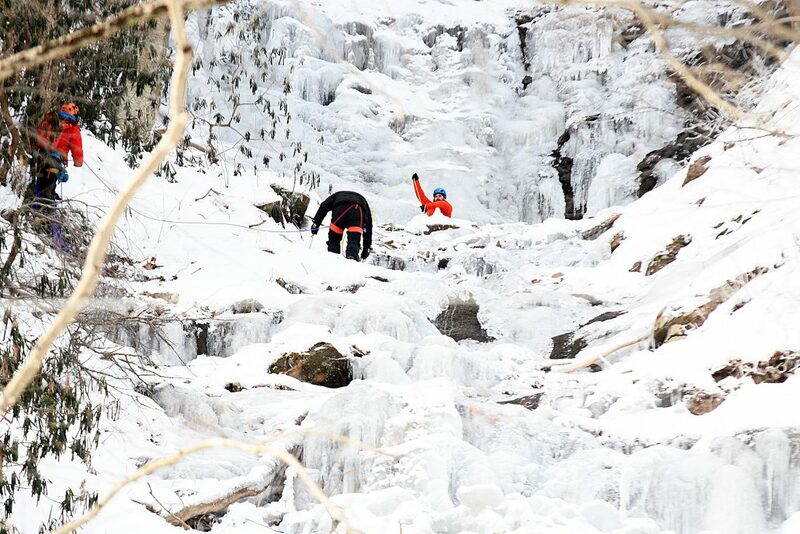 The cold snap created what may have been the one opportunity at ice climbing in Baker’s Run this winter. As if scaling a few hundred feet of ice isn’t enough, Roadside offers a bottom where virtually no pull-off exists. The bottom of the climb is Route 120 where drivers who observe the speed limit are going 55 miles an hour. Westley Shaffer, of Williamsport, was the eldest climber on Saturday at 29 years old; for C.J. it was his first time. Shaffer said he discovered Roadside and ice climbing while attending Lock Haven University. In fact, Shaffer founded the Lock Haven University Climbing Club in 2009 and nearly all of the ice climbers that have tackled Roadside with him are LHU alum. “Roadside’s location actually may be the best part of the climb. Geographically it’s not far for me to get to and it’s right along the road. Many places that we climb require a hike to get to,” Shaffer explained, as he talked about the group’s Feb. 2 climb. Shaffer said that two other climbs are also near Roadside. Hidden Amphitheater is about two miles toward Renovo from Roadside, and Gemini Gullies is on the opposite side of the Susquehanna River. “This area actually offers a lot of climbing opportunity,” he offered. The climber further explains that Roadside provides waterfall ice that can also be referred to as steep ice. 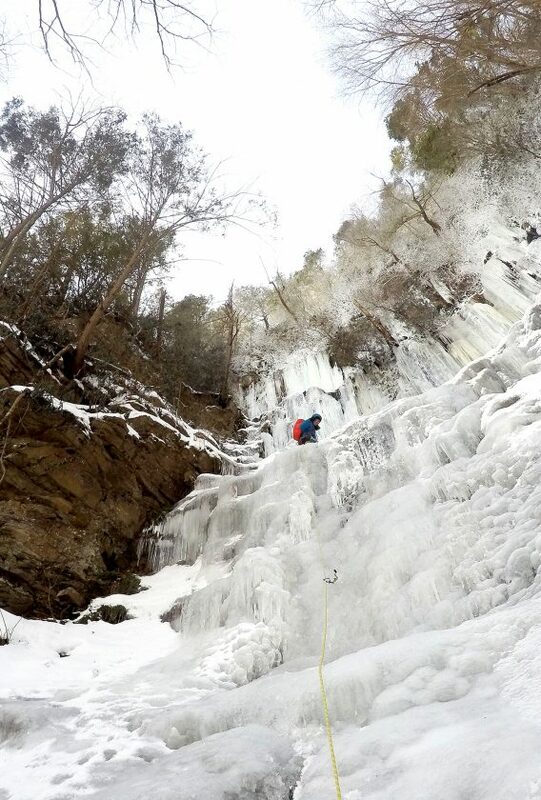 He said that other climbs such as those towards Indiana, Pa., offer spray ice that builds up after water splashes onto other surfaces and freezes there. What passersby may not realize is the true beauty lies near the top, about 250 feet up from the road, Shaffer said. Once the initial ramp of ice is scaled, the mountainside opens up into a huge semi-circle section of hilltop covered in ice and refered to as an ‘amphitheater’ because of its shape and size, he explained. The amphitheater offers three tiers in the curtains that can each be climbed and once up on the ramp about eight to 10 people could relax on a flat, looking up at the amphitheater, he continued. Shafer said he has spent the last few climbing seasons honing in on what clothes work for him. Typically, it’s expedition weight clothing — a goose down jacket that weighs less than a pound. Last Saturday when he reached different flat areas, he actually took his outer jacket off to ready the gear for other climbers, Shaffer said. Belaying is the term used for preparing ropes and spikes to keep all of the climbers safe, he said. Additionally, each climber is equipped with gear such as front-footed crampons, ice tools and axes. He noted that newer climbers may have more cumbersome clothing that often makes climbing initially more difficult. Dangers seem to be all around in ice climbing and the weather is an issue at all times, Shaffer said. Last Saturday’s single-digit temperatures at 6:30 a.m. forced one climber to repel due to cold toes, and Shaffer said at around 2 p.m. when he was repelling, the temperature had reached 30 degrees. He said he said he encountered wet ice and even some chunks breaking off with the warmer afternoon temps. The crew was fortunate to be able to climb last Saturday and likely it was their only chance this winter to tackle Roadside. “The conditions have to be very cold for an extended period of below freezing temperatures for us to be able to climb Roadside. This was probably the only chance that we will get this year,” Shaffer said. He said Dave Seasholtz runs a hikebikeclimb.net site that is used for people outside of the area to keep current with conditions. Shaffer said that he has climbed Roadside about 10 times and has scaled each tier of the amphitheater. He is a nice guy, patient in explaining his sport and complimentary of his fellow climbers and friends. It still may not be so easy explaining to people next winter when they see Shaffer and his crew climbing Roadside, that they really aren’t nuts after all.